You would not believe the horror stories I’ve heard from couples about huge fights on vacations! Well, maybe you would believe me! Maybe you’ve had one of those disasters. Hey, I tell couples, “Leave your issues at home and go have fun.” It’s easier to say than to do. Nothing can ruin a vacation quicker than unmet expectations. If you’d hoped to do X and you never get to do X it’s hard to be in a good mood. But, look: You don’t want to pout when you don’t get to do X. No one gets whatever they want whenever they want it and you are no different. If you don’t get what you want…adjust! Remember, how you handle unmet expectations is teaching your children how to cope in the future when they have to face adversity. You don’t want to be like the saying I had hanging on my bedroom wall when I was in 9th grade: “Don’t worry. You can always serve as a bad example.” So…it rains? The plans you made fell through? Figure out Plan B and have a ball in the process. In my last blog I mentioned how all of a sudden my wife and I were faced with an entire day with absolutely no plans. I was trying to think the last time that happened in our entire marriage! Usually our schedule is pretty packed. We’ve got most weekends planned. Work covers the workweek. So when do we have a day to do whatever? The only time is if we plan for it, which is pretty funny if you think about it! Having an unplanned day would be good to do anyway! We saw it as a gift. Here we were with an unplanned day sitting right in front of us. What do we do? 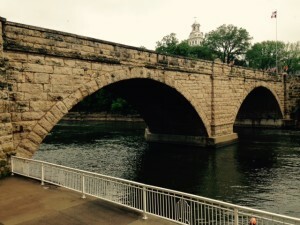 We decided to hit the River Bluffs Scenic Byway (page 15 of this PDF. I have it saved on my laptop in a folder called “Travel”) we were near at our campground and we ended up with a pretty enjoyable and memorable day. Along the Scenic Byway we happened by an Iowa Welcome Center just south of Elkader in Osborne (You can find the other Welcome Centers in Iowa at this website. Put in the section of the state you are interested in and choose the city and it’ll give you the location of the Welcome Center in that area. There are 45 of them, curiously none in Central Iowa where most of the people live. Most of the centers are around Okaboji and Southeast, Iowa. There are Centers on the Interestate Highways, also.). The travel center in Osborne was an interesting stop in and of itself and gave us lots of ideas for the day. We also picked up some other travel info about Iowa. We’ve lived in Iowa over 30 years and we’re still discovering new things. We’ve learned you don’t have to travel too far to find new and interesting things to do. Built in 1889 for a cost of $16, 282, the 346 foot bridge is the longest of its type west of the Mississippi. 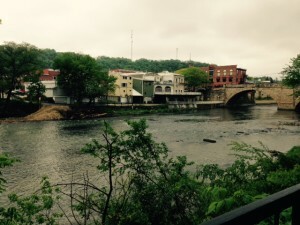 The Turkey River goes right through the main part of town. Many of the houses and apartments and businesses back up the river, making for a beautiful scene for the tenants. 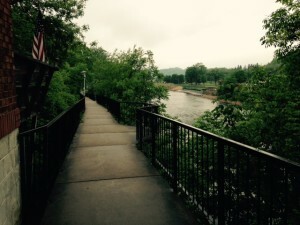 This trail bordered the river downtown Elkader right near the Keystone Bridge. We were sorry we didn’t bring our bikes with us. It looked like rain when we left and we had no idea there were pretty trails like this to explore. This map in the city park near the Keystone Bridge illustrates the many things there are to do in this part of Iowa, certainly more than we could explore in one day. We’ll definitely be back to see more. What a pretty area. 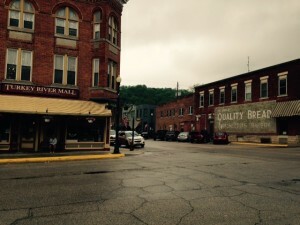 When we got to Elkader it was time for lunch and we happened by this quaint hamburger joint. No way. This kind of place is where we love to stop. 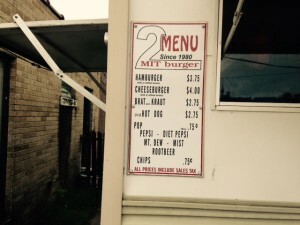 Love, love, love this menu: Four items…and pop. That’s it. I was going to take a picture of the hours and forgot. I wanted to send the pic of the hours to my son who’s a chef. His hours are brutal. This hamburger joint’s hours? Wed, Thur and Fri: 4-9 and 11-9 on Saturday and Sunday. Open Monday’s on Holidays. That’s it. 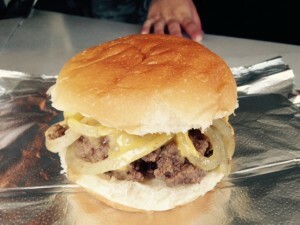 The guy making our burgers was very friendly and said he’d been doing it 20 years. 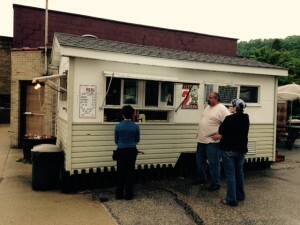 Apparently, he sold enough burgers to live in Elkader and run his own business. Good for him. Historic Downtown Elkader had several unique shops that we went through (such as the Turkey River Mall), making for a fun stop along the way. They’ve done a great job keeping the ambiance of older buildings and keeping the downtown alive and thriving. Check out this website on the area. 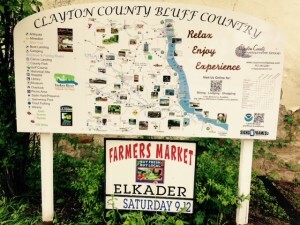 After exploring Elkader a few hours we road the rest of the River Bluff Scenic Byway, minus the two legs that went down to the Mississippi River. Those two legs would have been beautiful, but we were budgeting our time. Sadly, I forgot to take pictures of the landscape so have none to share with you. We were too busy drinking in the wonder. All in all a great little getaway. To get an idea of the scenery check out these images from Google on the River Bluffs Scenic Byway. In this series of Planning vs Spontaneous I hope you’ve seen these two characteristics are not incompatible, but complementary. We need them both to make vacation time go well. With my wife and I we’re both planners about different things and spontaneous about different things. I like to plan our trips out a bit. She just wants to be together. It doesn’t matter what we do. I like to just throw everything in the SUV. She likes to have it organized. I chaffed at that for a while until I realized she was pretty smart about that and that a certain amount of organizing keeps things in order. Finding things is a good thing. If everything has a place, then you know where to find it. I didn’t learn that at home as a child. My dad lost his keys every day and every day there was a key crisis. My wife taught be early on, no, you have a place for your keys and, frankly, a place for everything else. Hey, I can learn. What’s this deal about you having to be right about everything? Stop it already. Work together. If you haven’t seen the other blogs in this series: Planning vs Spontaneous, you can start here.